(iv) assessing the quality of one element of concrete in relation to another. 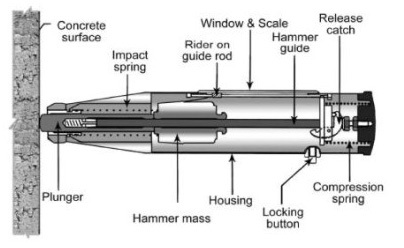 When the plunger of rebound hammer is pressed against the surface of the concrete, the spring- controlled mass rebounds and the extent of such rebound depends upon the surface hardness of concrete. The surface hardness and therefore the rebound is taken to be related to the compressive strength of the concrete. The rebound is read off along a graduated scale and is designated as the rebound number or rebound index. It consists of a spring controlled mass that slides on a plunger within a tubular housing. The impact energy required for rebound hammers for different applications is given in Table 1. Table 1 : Impact Energy for Rebound hammer for different Applications. IS-13311 (Part 2):1992 (Reaffirmed- May 2013) “Non Destructive Testing of Concrete-Methods of Test (Rebound hammer)”. It is necessary that the rebound hammer is checked against the testing anvil before commencement of a test to ensure reliable results. The testing anvil should be of steel having Brinell hardness of about 5000 N/mm2. The supplier/manufacturer of the rebound hammer should indicate the range of readings on the anvil suitable for different types of rebound hammers. The most satisfactory way of establishing a correlation between compressive strength of concrete and its rebound number is to measure both the properties simultaneously on concrete cubes. The concrete cube specimens are held in a compression testing machine under a fixed load, measurements of rebound number taken and then the compressive strength determined as per IS: 516- 1959. The fixed load required is of the order of 7 N/mm2 when the impact energy of the hammer is about 2.2 Nm. The load should be increased for calibrating rebound hammers of greater impact energy and decreased for calibrating rebound hammers of lesser impact energy. The test specimens should be as large a mass as possible in order to minimise the size effect on the test result of a full scale structure. 150 mm cube specimens are preferred for calibrating rebound hammers of lower impact energy (2.2 Nm), whereas for rebound hammers of higher impact energy, for example 30 Nm, the test cubes should not be smaller than 300 mm. If the specimens are wet cured, they should be removed from wet storage and kept in the laboratory atmosphere for about 24 hours before testing. To obtain a correlation between rebound numbers and strength of wet cured and wet tested cubes, it is necessary to establish a correlation between the strength of wet tested cubes and the strength of dry tested cubes on which rebound readings are taken. A direct correlation between rebound numbers on wet cubes and the strength of wet cubes is not recommended. Only the vertical faces of the cube as cast should be tested. At least nine readings should be taken on each of the two vertical faces accessible in the compression testing machine when using the rebound hammers. The points of impact on the specimen must not be nearer an edge than 20 mm and should be not less than 20 mm from each other. The same points must not be impacted more than once. For testing, smooth, clean and dry surface is to be selected. If loosely adhering scale is present, this should be rubbed of with a grinding wheel or stone. Rough surfaces resulting from incomplete compaction, loss of grout, spalled or tooled surfaces do not give reliable results and should be avoided. The point of impact should be at least 20 mm away from any edge or shape discontinuity. For taking a measurement, the rebound hammer should be held at right angles to the surface of the concrete member. The test can thus be conducted horizontally on vertical surfaces or vertically upwards or downwards on horizontal surfaces. If the situation demands, the rebound hammer can be held at intermediate angles also, but in each case, the rebound number will be different for the same concrete. Rebound hammer test is conducted around all the points of observation on all accessible faces of the structural element. Concrete surfaces are thoroughly cleaned before taking any measurement. Around each point of observation, six readings of rebound indices are taken and average of these readings after deleting outliers as per IS:8900-1978 becomes the rebound index for the point of observation. The rebound numbers are influenced by a number of factors like types of cement and aggregate, surface condition and moisture content, age of concrete and extent of carbonation of concrete. Concretes made with high alumina cement can give strengths 100 percent higher than that with ordinary Portland cement. Concretes made with super sulphated cement can give 50 percent lower strength than that with ordinary Portland cement. Different types of aggregate used in concrete give different correlations between compressive strength and rebound numbers. Normal aggregates such as gravels and crushed rock aggregates give similar correlations, but concrete made with light weight aggregates require special calibration. The rebound hammer method is suitable only for close texture concrete. Open texture concrete typical of masonry blocks, honeycombed concrete or no-fines concrete are unsuitable for this test. All correlations assume full compaction, as the strength of partially compacted concrete bears no unique relationship to the rebound numbers. Trowelled and floated surfaces are harder than moulded surfaces, and tend to over estimate the strength of concrete. A wet surface will give rise to under estimation of the strength of concrete calibrated under dry conditions. In structural concrete, this can be about 20 percent lower than in an equivalent dry concrete. The relationship between hardness and strength varies as a function of time. Variations in initial rate of hardening, subsequent curing and conditions of exposure also influence the relationship. Separate calibration curves are required for different curing regimes but the effect of age can generally be ignored for concrete between 3 days and 3 months old. The influence of carbonation of concrete surface on the rebound number is very significant. Carbonated concrete gives an overestimate of strength which in extreme cases can be up to 50 percent. It is possible to establish correction factors by removing the carbonated layer and testing the concrete with the rebound hammer on the uncarbonated concrete. The rebound hammer method provides a convenient and rapid indication of the compressive strength of concrete by means of establishing a suitable correlation between the rebound index and the compressive strength of concrete. The procedure of obtaining such correlation is given in 4.2. It is also pointed out that rebound indices are indicative of compressive strength of concrete to a limited depth from the surface. If the concrete in a particular member has internal microcracking, flaws or heterogeneity across the cross-section, rebound hammer indices will not indicate the same. As such, the estimation of strength of concrete by rebound hammer method cannot be held to be very accurate and probable accuracy of prediction of concrete strength in a structure is ±25 percent. If the relationship between rebound index and compressive strength can be checked by tests on core samples obtained from the structure or standard specimens made with the same concrete materials and mix proportion, then the accuracy of results and confidence thereon are greatly increased.